began with the image of a sign. It simply said “One”. It was pearlescent white with pale blue letters and some wavy lines of pale blue around the letters. What followed was a frightening scenario of the twisting of a beautiful and true idea into an excuse for a cruel totalitarianism. It was shown to me as a possible future, one way future possibilities could collapse into a reality. I was told this could be the state of affairs in two hundred years. It is a tenet of many spiritual disciplines that we are one with all other human beings, one with all other life forms and one with the Earth and the Universe. It is a beautiful teaching and can lead to selfless behavior as well as the ability to see things from another’s point of view. So far so good. We are told that when the true sage reaches enlightenment she becomes one with all and perceives a continuum between herself and All That Is. Modern physics teaches that any particle that has ever touched any other particle in the universe is aware of that other particle into infinity despite any huge physical distance. In this future possibility of reality that I saw, a (nearly world) government is set up with a mandatory state religion in which this Oneness is the central idea. There is an invisible central power which decides what the denizens of this world must do all in the name of “The One”. It is a cruel existence in an environmentally ruined land, lacking uniqueness and diversity. It is a horrible perversion of a beautiful idea. In retrospect this premonition sounds like an Ayn Rand novel of some sort. Alas I am not a Libertarian but tend more politically to the Green Party. But this is what I saw. Earlier this year on this blog, (https://fahrusha.wordpress.com/2010/02/05/no-ufo-disclosure-in-sight-in-2010-but-possibly-an-earth-shaking-revelation/) I predicted that while it was unlikely that there would be any government disclosure on U.F.O.s, it was probable that it would be announced in the not so distant future that rudimentary life had been found elsewhere in the universe. I believe that the above referenced report on Titan, the largest moon Saturn, is a vanguard in this important development. 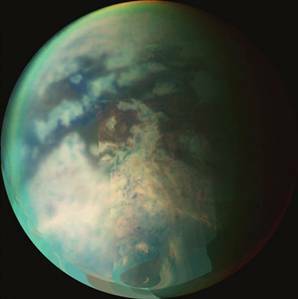 The type of life postulated on Titan would be methane based. If that is the case, it would change the way many researchers think about life as strictly a carbon based system. The Huygens probe, part of the Cassini-Hugyens space mission, was the first Earth based probe to land on Titan. The mission was launched from Earth in 1997 and the Huygens probe landed on January 14, 2005 and continued to send data for about 90 minutes after reaching the surface of Titan. Its discovery of surface liquid revolutionized scientific thought about Titan. Here is an informative talk about Titan, Enceladus and Saturn by planetary scientist Carolyn Porco.